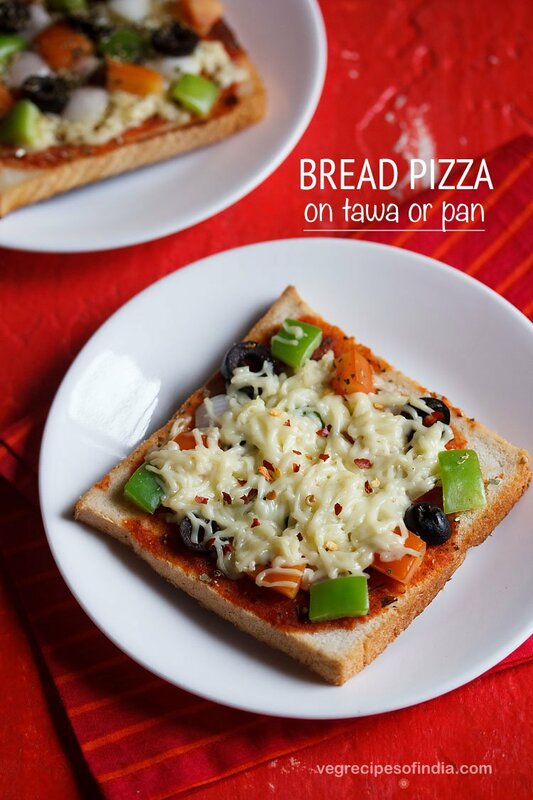 bread recipes for snacks – collection of 40 tasty snacks recipes that you can make with bread. you can choose any bread of your choice like whole wheat bread or brown bread or white bread. though using whole wheat bread is a healthier option. 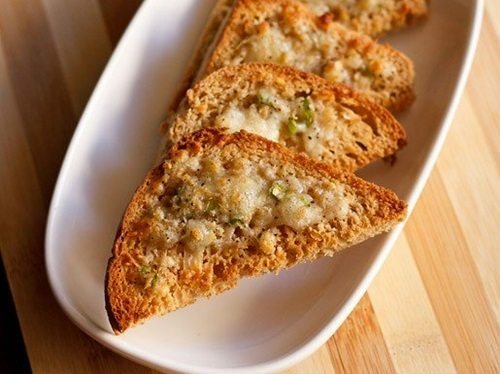 there are many snacks recipes that can be made with bread. in this collection i have listed all the snacks recipes that are made with bread. i will keep on updating the post as i had more snacks recipes with bread. to make these bread snacks recipes, you can use fresh bread or a one to two days old bread. most of the times i prepare simple toasts or veg sandwiches with bread. but on occasions i also prepare snacks like pakora, rolls and puddings with bread. 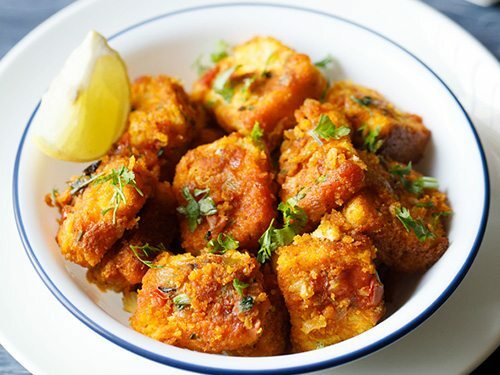 these snacks can be served with most indian chutneys or dips. in india we have variety of chutney recipes to go along with snacks and starters. depending upon the snack, you can serve them with pudina chutney or coriander chutney or coconut chutney or tamarind chutney or with tomato sauce. i have only included popular sandwich varieties in this post. otherwise the post will become too big. 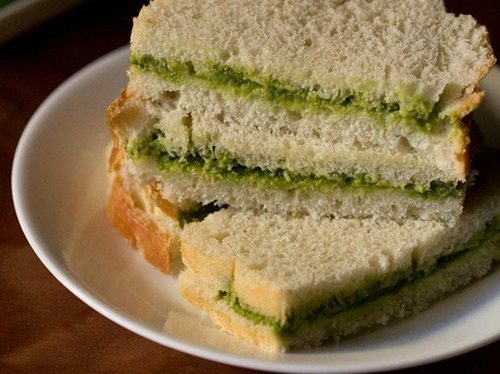 if you want to check all the sandwich recipes you can make with bread, then you can check this collection of 34 sandwich recipes. 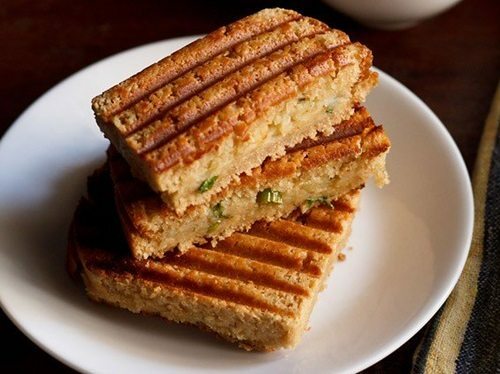 1. veg sandwich – spiced street food snack of toast sandwiches from mumbai. 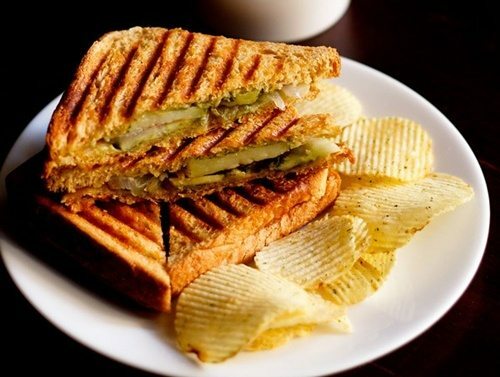 what adds spice to the veg sandwich is the spicy coriander chutney, black salt and chaat masala. for more tasty street food recipes from mumbai you can check this post – 30 best mumbai street food recipes. 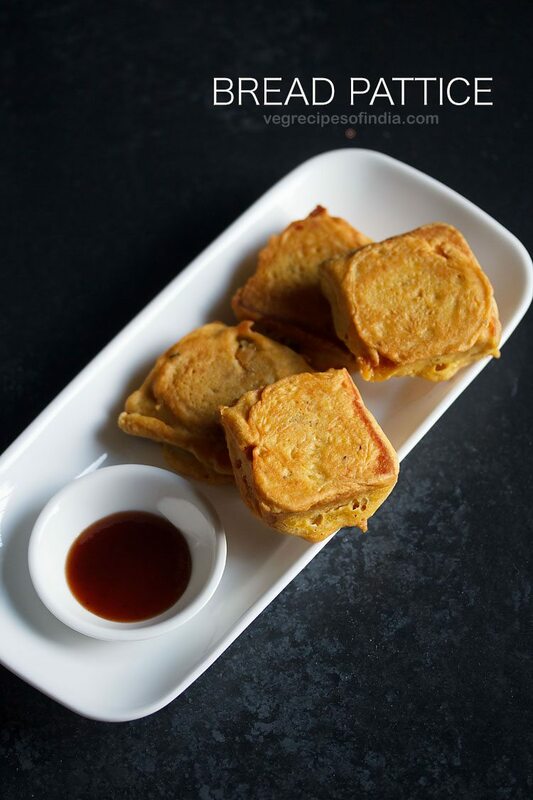 2. bread pakora – popular snack recipe of bread stuffed with a filling of mashed & spiced potatoes, dipped in besan and deep fried. one can be innovative in making the filling. though, mashed potatoes is a common filling used. 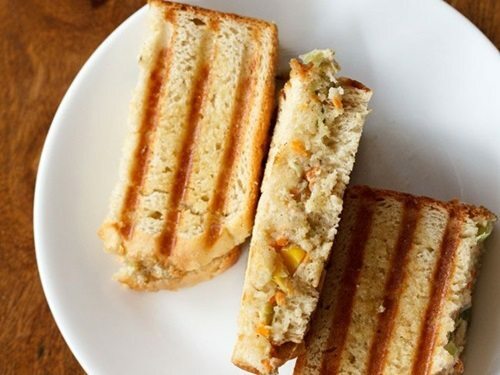 4. potato sandwich – to make these grilled sandwiches with a spiced potato stuffing is very easy. all you need are some boiled potatoes, spices, butter and bread. 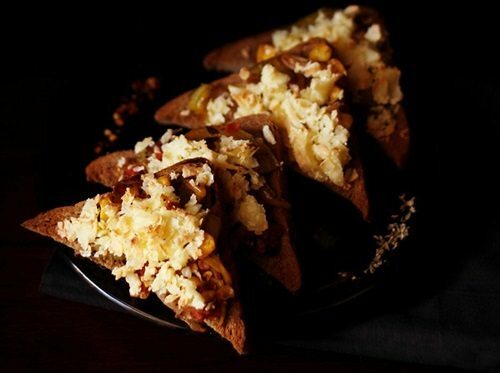 6. cheese chili toast recipe – tasty cheese toast spiced with chilies and ginger. an easy breakfast to prepare and serve. 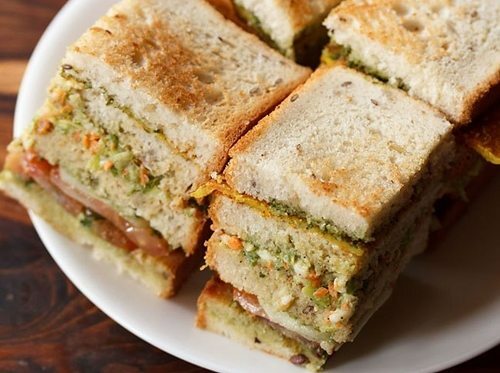 7. grilled sandwich recipe – a bombay vegetable sandwich spiced with cilantro chutney and grilled. grilling the sandwich makes the bread slices golden crisp and many people like it that way. 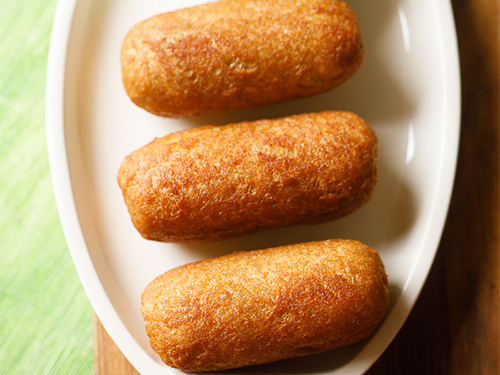 8. bread roll recipe – crisp bread rolls with a soft spiced mashed potato filling. a snack that can be made in a jiffy if you have leftover boiled potatoes. these bread rolls are a favorite at home and i usually pair them with the evening chai as a snack. 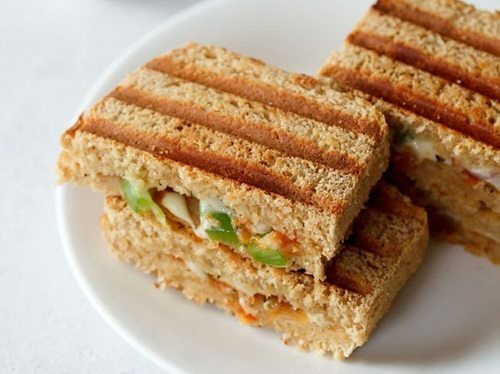 9. paneer sandwich recipe – simple and easy breakfast or snack idea of grilled paneer sandwich. 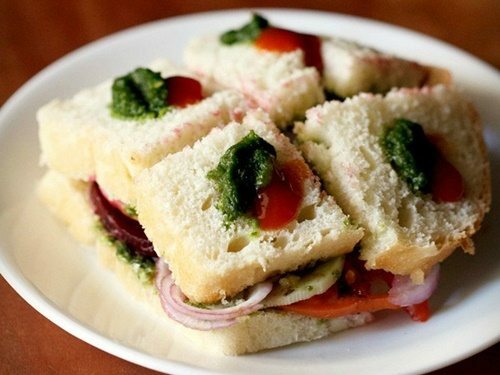 the recipe shared is an indian style paneer sandwich which includes green chutney, spices and herbs. 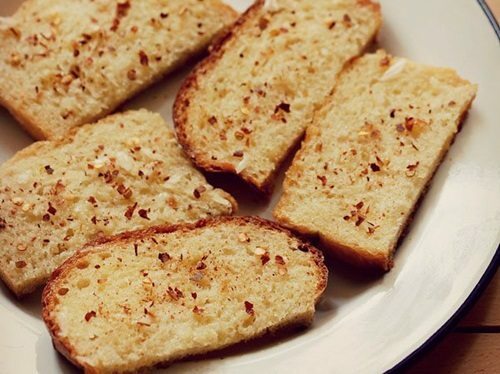 10. garlic bread recipe – a super easy recipe of making garlic bread on a tawa or frying pan and without the oven. usually i make garlic bread as an accompaniment to soup or as a starter. but they equally taste good with tea or coffee. 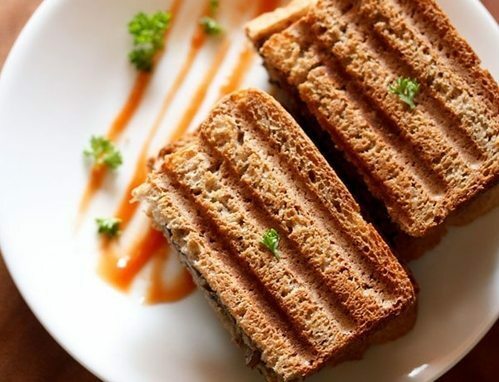 12. club sandwich recipe – this recipe is the club sandwich that used to be served in the restaurants in mumbai. 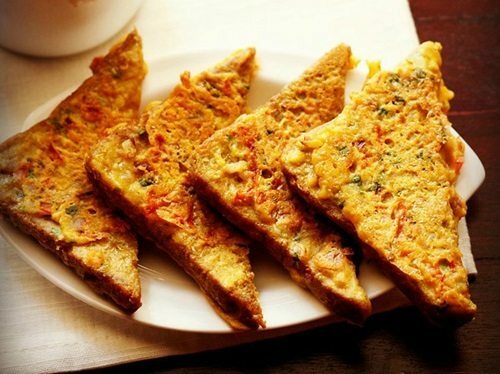 besan chilla or tomato omelette is used as one of the stuffing. there is a layer of cucumber, lettuce and tomato. the third layer is of cheese or grated veggies like cabbage and carrots mixed with mayonnaise or just plain cheese slices are used. 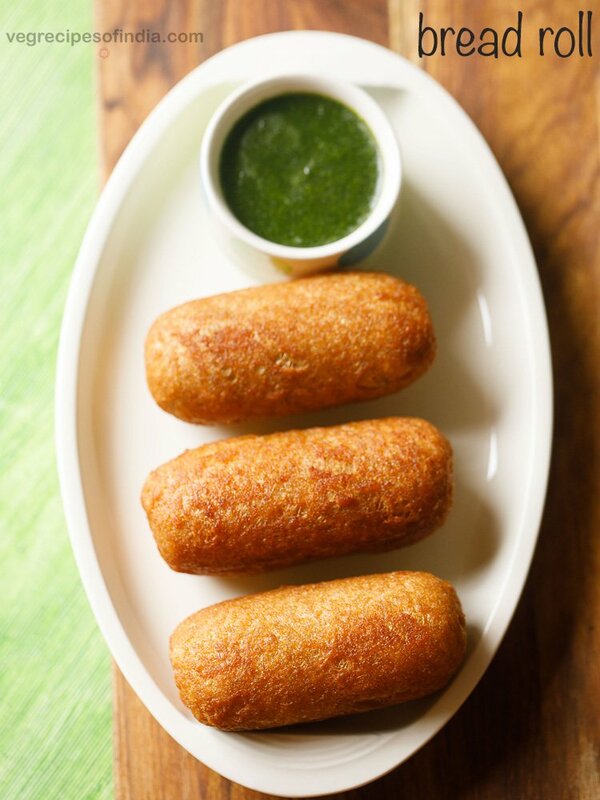 13. paneer bread roll recipe – quick baked snack of bread rolls stuffed with a spiced paneer stuffing. no onion no garlic recipe. 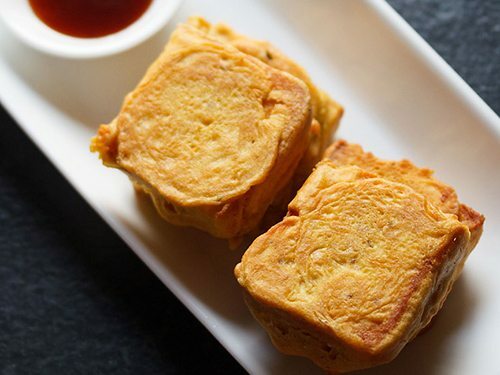 tofu can be substituted instead of paneer. 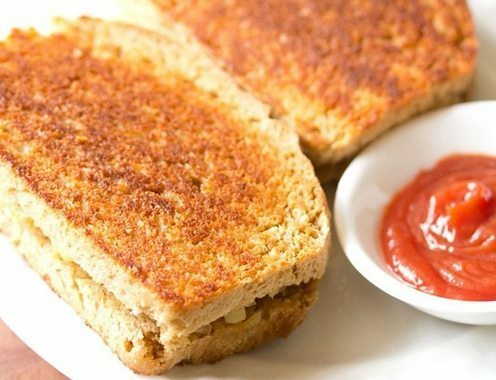 14. cheese sandwich recipe – crisp cheesy sandwiches with indian spices and grilled. 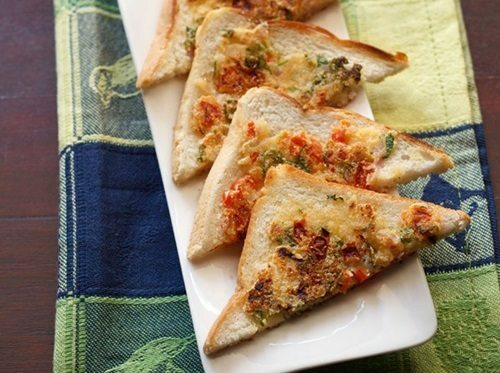 this is one of our favorite breakfast and it does not take much time to make these cheese sandwiches. 15. chocolate sandwich recipe – quick easy grilled chocolate sandwich made with choco chips. this sandwich is a quick and easy to prepare sweet snack. 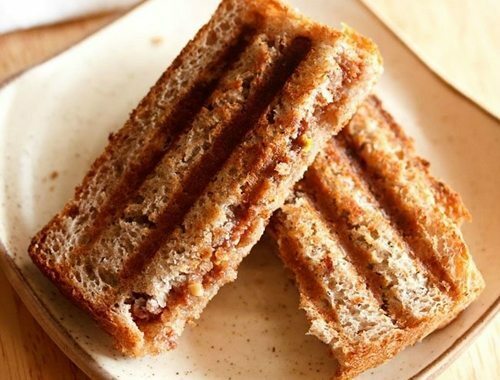 kids love these sandwiches and even grown ups cannot say no to them if they are chocolate lovers. 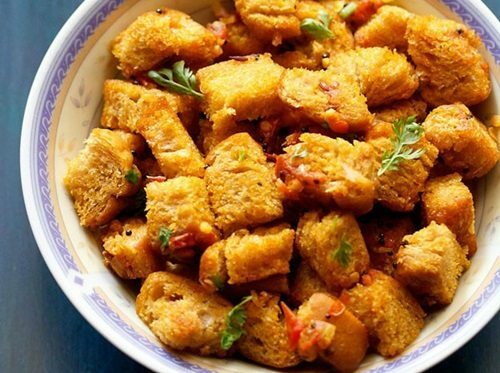 16. bread cutlet recipe – crispy and tasty cutlets made with bread and mixed veggies. 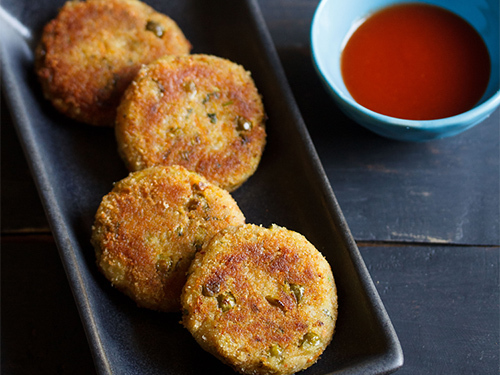 this bread cutlet recipe is similar to the way i make veg cutlets. just that in this recipe more bread is added which gives a nice soft texture within the cutlets. 17. mushroom sandwich recipe – an easy sandwich recipe made with sauteed mushrooms. the recipe is simple to make and tastes good too. can be toasted or grilled. for more delicious mushroom recipes, you can check this post – collection of 49 mushroom recipes. 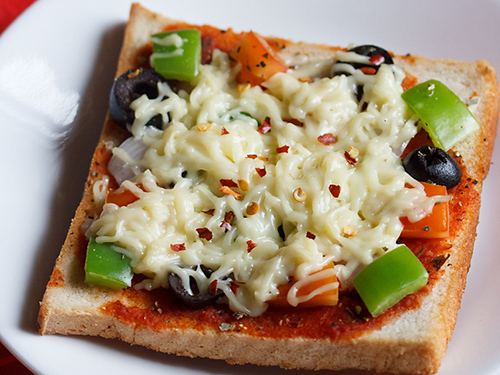 18. bread pizza in oven – easy to make bread pizza with veggies and cheese. for this bread pizza recipe, you don’t need ready pizza sauce. but if you have, then your work is reduced and and you just need to place the veggies on the sauce smeared toasted bread slices. 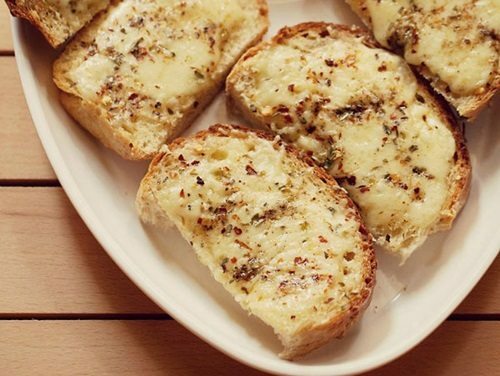 19. cheese garlic bread recipe – easy to make quick 15 minute cheese garlic bread recipe for the those folks who want a quick breakfast or brunch. 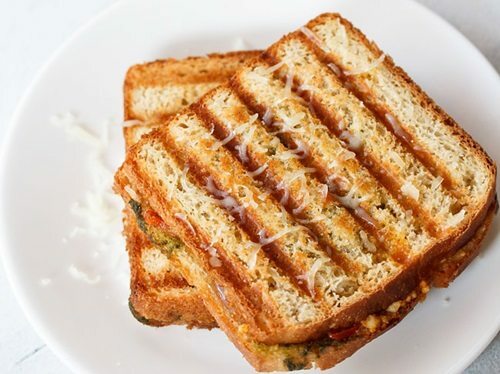 use any bread and cheese of your choice. 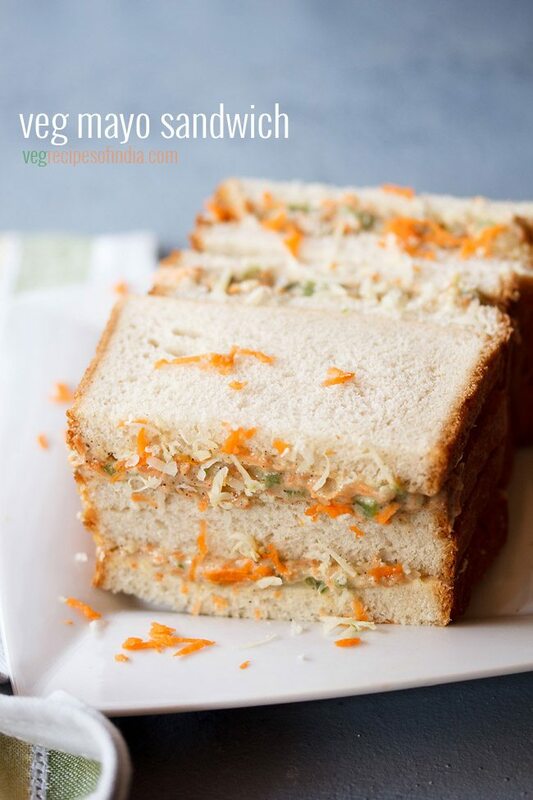 20. coleslaw sandwich – quick to prepare sandwiches with veg coleslaw. i have used a mix of cabbage, carrots and capsicum. 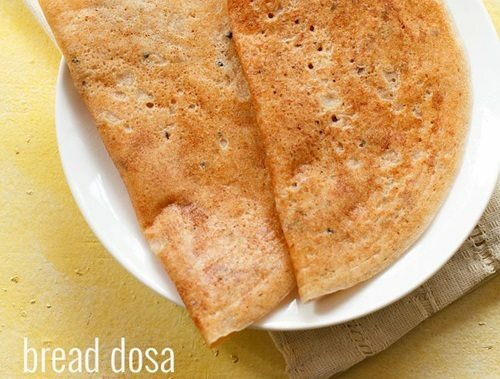 21. bread dosa – its one of the easiest dosa one can make. though i always prefer the ground fermented dosa batter as nothing beats the taste and texture of dosas made the traditional way. but at times one is looking for quick and easy breakfast solutions, so these instant recipes come in handy. i have also compiled the collections of dosas and instant recipes → 28 dosa recipes and 22 quick and instant recipes. 22. bread cheese roll recipe – easy to prepare baked bread rolls with a cheesy spiced potato stuffing. you can choose the filling you want. i usually go for the classic potato-cheese combination. 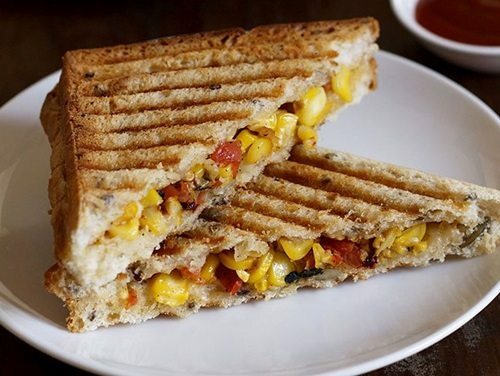 23. corn sandwich recipe – the filling for this corn sandwich is italian inspired with tomatoes, garlic and fresh basil. 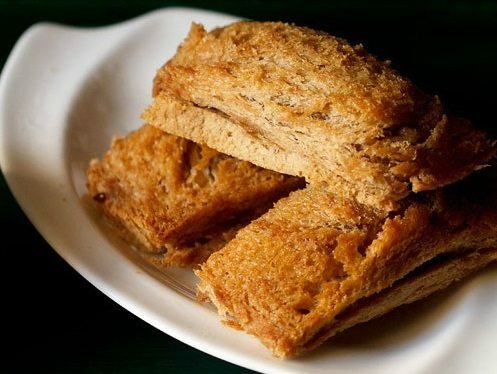 24. bread sooji toast – easy to prepare toast with semolina (rava or cream of wheat), onion, tomato and cream filling. the choice of bread is yours – white bread, whole wheat bread or brown bread. you can use fresh bread or even a few days old bread. 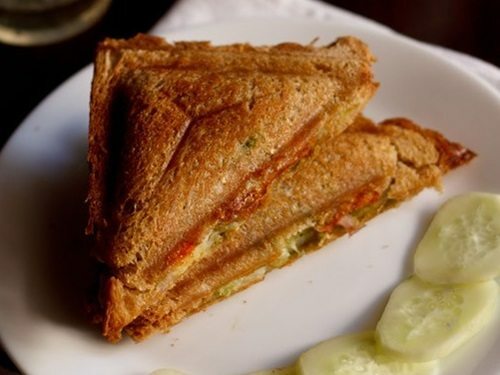 25. veg cheese toast sandwich – this recipe is a bombay style veg cheese toast sandwich. to make spicy sandwiches, increase the number of green chilies in the mint-coriander chutney. 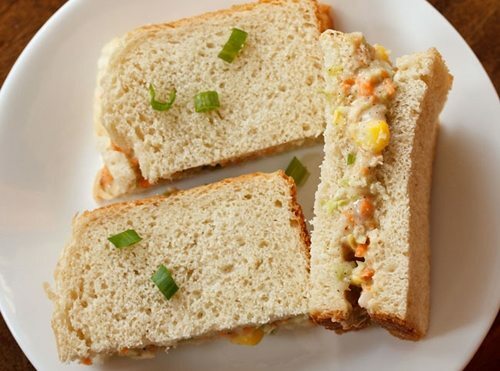 26. curd sandwich – quick and easy sandwich recipe with a spiced veggie curd filling. 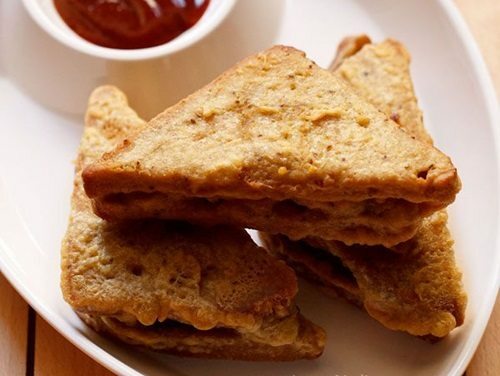 27. cheese stuffed bread pakoda – i have used cheese slices as a stuffing for the bread. you can also use the bread as it is without any filling. you can also have the combination of potatoes and cheese as the stuffing. 28. pizza sandwich – these pizza sandwiches are basically grilled sandwiches. though you can also make toast sandwiches. you can add veggies of your choice in the stuffing like steamed baby corn or boiled sweet corn. 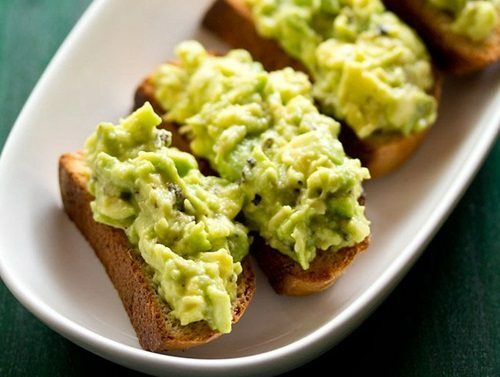 29. avocado garlic toast recipe – easy and a quick breakfast recipe of avocado garlic toast. the recipe gets done within 15 minutes. avocado is also called as butter fruit. in hindi its known as makhan phal. 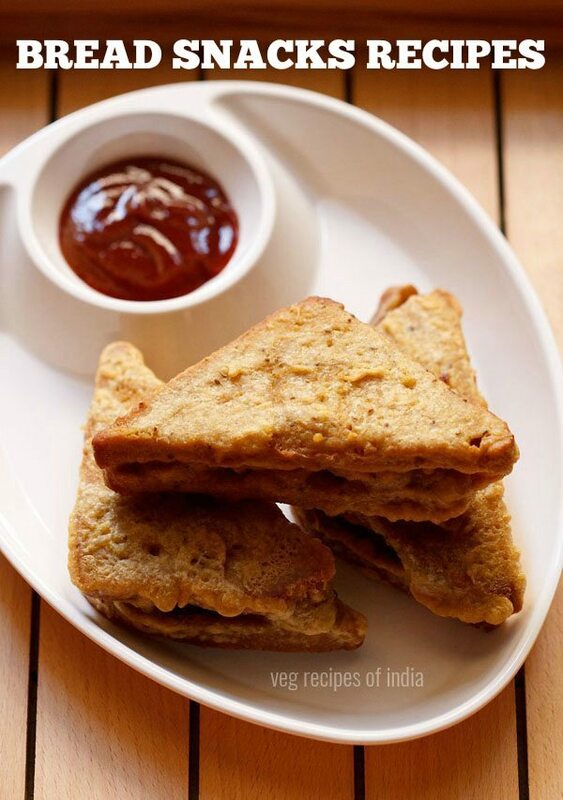 30. besan toast recipe – one of those quick breakfast recipes that can be made in a jiffy. just takes about 15 to 20 minutes. all you need is besan (gram flour), the usual indian spices-herbs and bread. 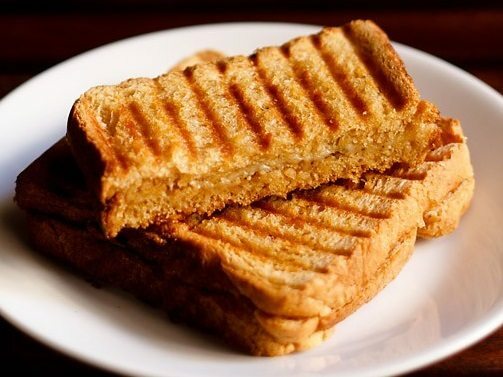 31. tawa sandwich recipe – simple but delicious grilled sandwiches stuffed with a spiced potato filling. 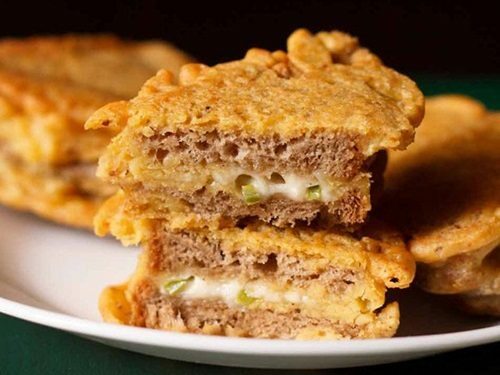 32. bread patties recipe – these are easy and tasty patties made with bread and spiced mashed potatoes. 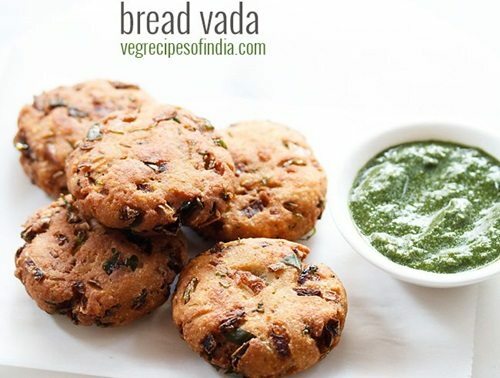 for the stuffing of bread pattice, i have used the same stuffing that is made for batata vada. but you can always change the stuffing as per your liking. also some grated cheddar cheese can also be added. 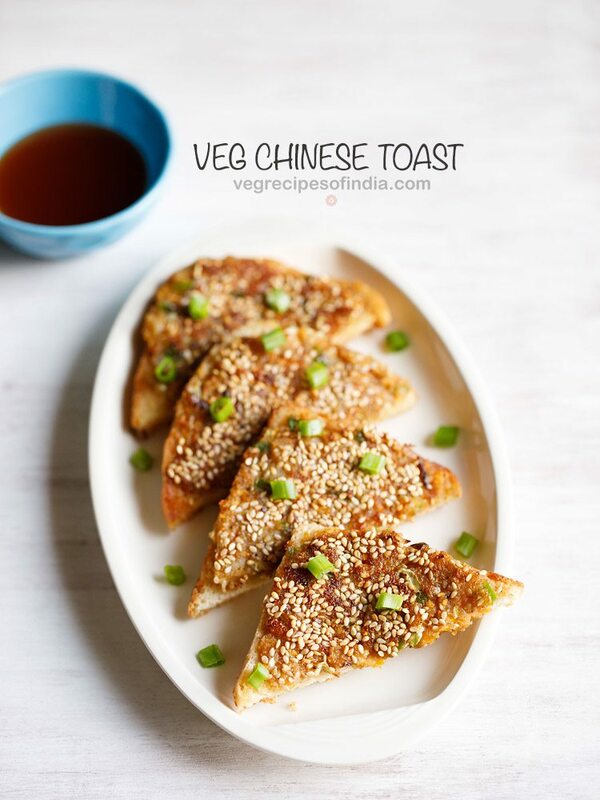 33. masala bread recipe – one of the quickest, yummiest and easiest snack you can make with bread is masala bread. 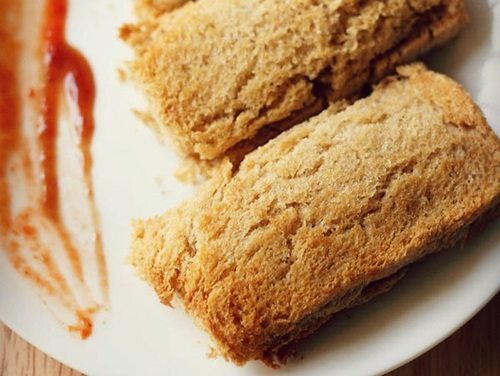 this recipe is a spicy version of masala bread. 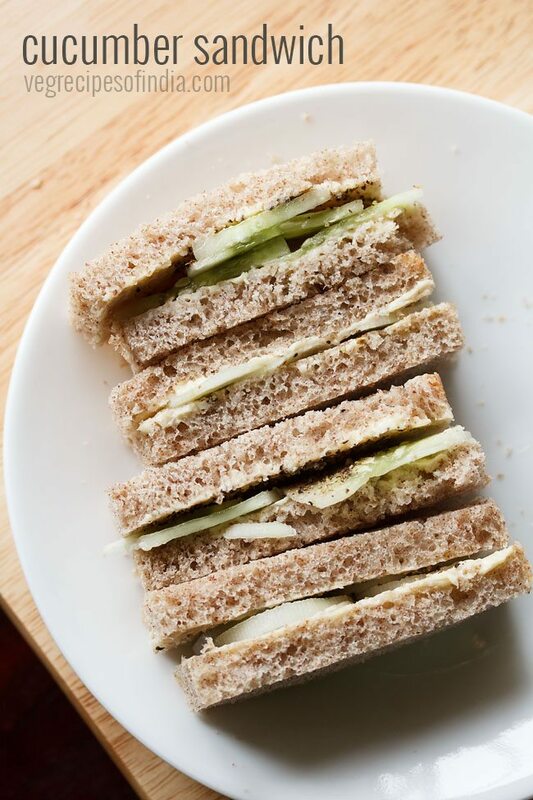 34. chutney sandwich recipe – a four ingredient, quick and easy to prepare chutney sandwich. no onion no garlic recipe. 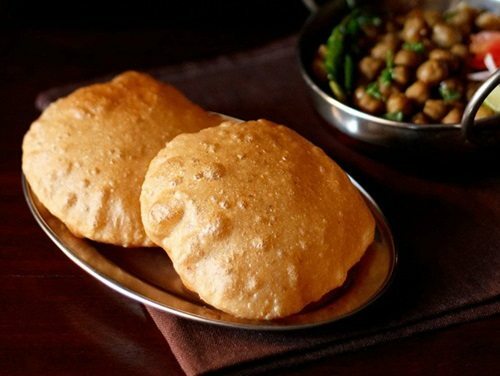 35. bread bhatura recipe – quick bhatura made with bread slices and whole wheat flour (atta). the recipe does not require to leaven the dough for hours. if you love having bhatura with chana masala then you can also check these recipes – easy bhatura or aloo bhatura or this popular bhatura recipe. 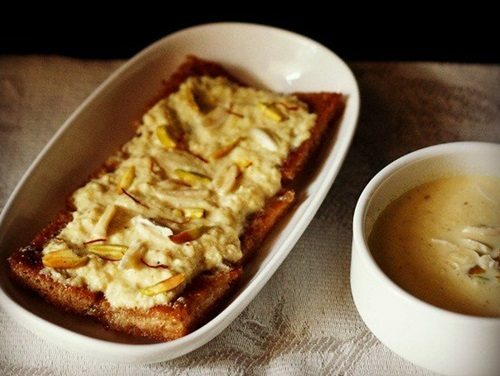 35. shahi tukda recipe – a rich, royal mughlai dessert of fried sugar syrup coated bread topped and soaked with fragrant creamy sweet thickened milk or rabri and garnished with dry fruits. 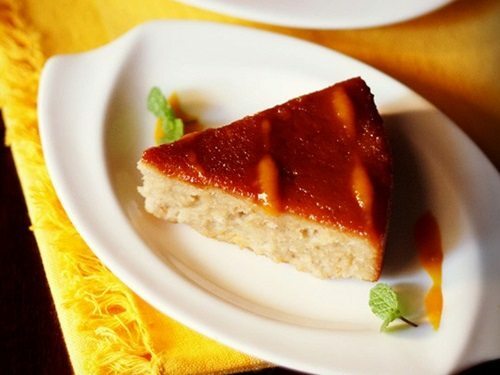 36. double ka meetha recipe – easy and delicious recipe of hyderabadi style double ka meetha made with sweetened condensed milk. here condensed milk is used to replace rabri or thickened milk. hence this eliminates the need of making sugar syrup. 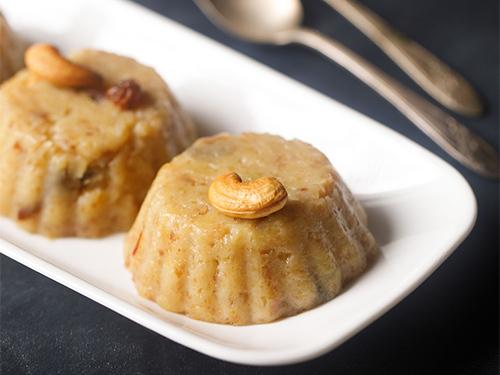 37. bread halwa -a variation of halwa made with bread slices. 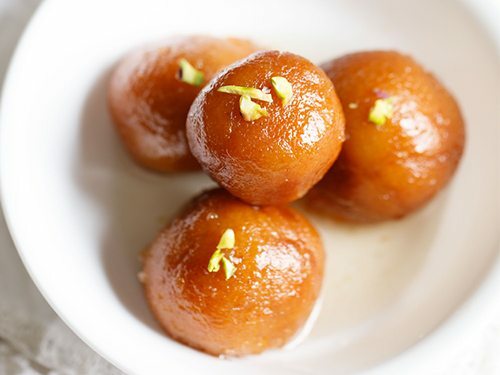 to make bread halwa, bread cubes are first fried or roasted in ghee and later cooked with milk and sugar. 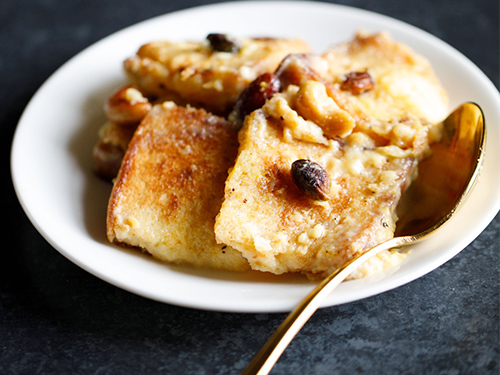 39. eggless bread butter pudding recipe – easy to prepare pudding with whole wheat bread, butter and eggless custard. it goes extremely well as a dessert in itself. you can top the pudding with chocolate sauce or caramel sauce, if you prefer. 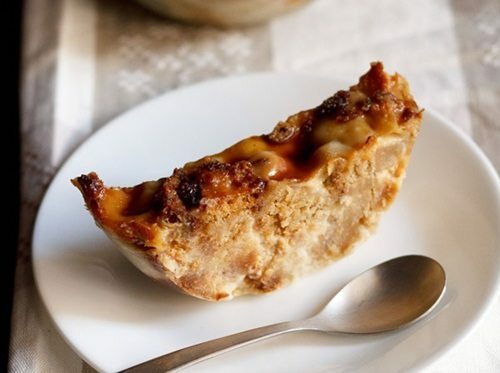 40. eggless caramel bread pudding recipe – this is a smooth, melt in the mouth pudding made with caramel and bread slices. here the caramel is made by melting sugar. not difficult but yes does require some practice. the pudding is steamed and hence does not need an oven. have taken the request. will try to add.